Defining Asatru can prove to be difficult, simply because of the nature of most of the concepts that are associated with Asatru- and the traditional practices therein. Asatru can roughly be translated to "Belief in the Gods"/"Faith in the Gods"/""True to the Aesir"
It is a rebirth of the faith held by (pre-Christian) Norse peoples, and considered largely to be a sort of tribal or folk religion. It is a branch of the Teutonic family of beliefs (pre-Christian Scandinavian, Anglo-Saxon, ancient Germanic peoples, etc). Asatru is a polytheistic faith, honoring a multitude of Gods and Goddesses as well as lesser beings. Those who practice Asatru tend to honor the main two families of Gods: the Aesir and the Vanir. However, there is also the honoring of ancestors and spirits. It is important to note the special relationship between someone who practices Asatrua and the Gods: there is a sense of equality and kinship between these two. While practitioners honor and commune with them, they do not humble themselves before them. The literature concerning Asatru is wide and vast: Asatru has manny writen forms of lore and tradition, such as the Eddas, Sagas and other Icelandic writings that were collected and preserved back in the Middle Ages. Most of these writings are seen are symbolic and not to be taken literally. It is believed that through these stories, lessons on our own nature and divinity can be learned. What are some of its beliefs? "We believe in an underlying, all-pervading divine energy or essence which is generally hidden from us, and which is beyond our immediate understanding. We further believe that this spiritual reality is interdependent with us - that we affect it, and it affects us. We believe that this underlying divinity expresses itself to us in the forms of the Gods and Goddesses. Stories about these deities are like a sort of code, the mysterious "language" through which the divine reality speaks to us. We believe in standards of behavior which are consistent with these spiritual truths and harmonious with our deepest being." We are polytheistic. That is, we believe in a number of deities, including Goddesses as well as Gods. We do not accept the idea of "original sin", the notion that we are tainted from birth and intrinsically bad, as does Christianity. Thus, we do not need "saving". We do not claim to be a universal religion or a faith for all of humankind. In fact, we don't think such a thing is possible or desirable. The different branches of humanity have different ways of looking at the world, each of which is valid for them. It is only right that they have different religions, which of course they do." "Asafolk view the gods in many different lights. There are those of us who nearly atheists, believing the Gods and Goddesses to be manifestations of pure Nature, and preferring to trust in their own might and judgment entirely. For these folks, Asatru provides a context for their culture and it's continuity. Others are literalists, believing the Eddas and Sagas to be divinely inspired, and believing the gods and goddesses to be literal physical entities. Most fall somewhere in the middle: finding our roots in the culture and our spiritual path on the road with the Shining Gods and Goddesses." Under Asatru, labels such as "good"/"evil" and "black"/"white" are frowned upon. We believe them to not be constants, and to have the capacity to change due to perspective and situational changes. We believe in an afterlife, where those who have lived virtuously will continue to live in that manner while those who have lived otherwise will live in dullness or darkness. We do not try to understand the nature of the afterlife, because it is beyond our comprehension. It is regarded in the same way many of the stories are. Under some Asatru writing, it is believed that the Earth was formed of natural happenings (through fire and ice, symbolically) but much like the afterlife we do not dwell on it and we leave it up to science to figure it out. We live in the here and now, and neither of those two extremes are held as too important. We are the ultimate deciding factor in our fates, in our souls, and in our lives. Family is regarded highly in Asatru. Community follows after that. Asatru people tend to form small, close-knit groups which are called Kindreds (though sometimes referred to as hearths, halls, etc). Some of these groups have designated Priests/Priestesses while others are more volunteer-type functioning. The main ceremony is called a Blot- which is an offering of sorts. There is drinking of mead, toasting and honoring to the Gods, and boasting or making oaths/vows. It generally goes: Invocation-toast-toast-toast-vows-Offering. This is sometimes referred to as a sumbel. There are many other rites, but for the sake of being brief I will not list them. 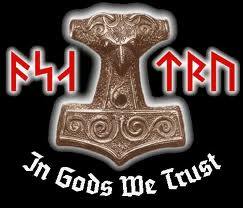 Keep in mind, Asatru is a very individualized practice and belief. You do not have to join a kindred or any sort of group to associate yourself with it. You do not have any set beliefs that you are forced to uphold. There is no moral code you are forced to follow. It is up to you what you will do and believe.